Some cool cat who tried on new identities practically every day was a real hepcat on the day he joined my work team. He carried his music everywhere. I think some people thought he inflicted his music everywhere, but he was really into the Joe Jackson album. I’m not sure he ever knew it was all covers of old songs, though that was probably hard to miss. I do doubt that Louis Jordan meant anything to him. The tunes stuck in my head. They’ll do it to you, too, if you’re not careful. I remembered the name and started buying the various compilations that popped up here and there. They were mostly imports and it was difficult to make heads or tails of Jordan’s career. That’s the thing that always seemed strange. I felt down to my toes that this was major music in the pop and rock arena. There is something so perfect and clear about how it lays the ground work for everything that happened in the 1950s and beyond. Other than a few nods to Jordan’s song Caldonia, there was so little information out there. Every discovered song re-enforced my feeling that I needed more. it’s become apparent that I lived on an island of ignorance. Plenty of people adored Louis Jordan. There never would have been so many re-issues. But, he was not of that moment and he wasn’t getting the attention that could filter through a world of radio, television, magazines and newspapers. Elvis and the Beatles certainly were well-documented. 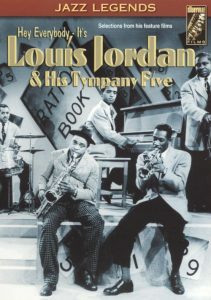 Serious digging provided a few Louis Jordan snippets, but I mostly stumbled on them while looking for something else. Mostly, that’s how it goes. We ramble through life and bump up against some art that sticks to us like brambles, but it’s hard to really get invested. I don’t bother half as much as I did when I was young, even if it has become easier. I don’t want to imagine a world in which no one hears Is You Is or Is You Ain’t My Baby?, but I can easily imagine a world in which people hear it and like it and have no further clue about the song. That’s not too far afield from how most of us consume art most of the time. I can’t imagine being constantly open to full evaluations of every picture and word and note, so it means coming to terms with the temporal nature of all these creations. Maybe that’s part of the high value that we place on art. We know that it is always somewhere between momentary and decades, but never just how long it will last. You’ve Got to Check This Out is a blog series about music, words, and all sorts of artistic matters. It started with an explanation. 44 more to go.